Friday's Stronach 5, with an industry-low 12-percent takeout and a $100,000 guaranteed pool, will include two turf races from Gulfstream Park and a maiden special weight event from Santa Anita Park for 3-year-old fillies. 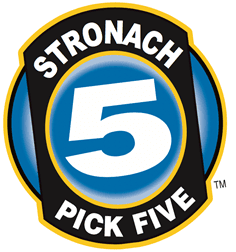 The Stronach 5 begins at 5:16 p.m. with maiden fillies and mares going six furlongs at Laurel Park. After an allowance optional claimer for 3-year-olds and up at five furlongs on the turf at Gulfstream, the Stronach 5 heads to Golden Gate Fields for 3-year-old maiden fillies going six furlongs. After heading back to Gulfstream for 3-year-old maiden fillies going 7 ½ furlongs on the turf, the sequence wraps up at Santa Anita with a field of 11 3-year-old maiden fillies. This entry was posted in Horseplayers and tagged exotic bets, exotic wagers, horseplayers, stronach 5, stronach group, stronach pick 5 by Press Release. Bookmark the permalink.